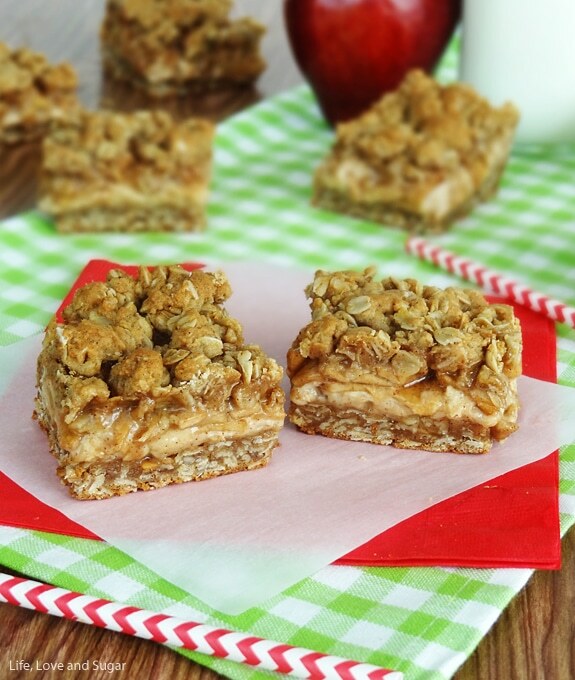 These Cinnamon Apple Oatmeal Cheesecake Bars are fall in a pan. No joke. 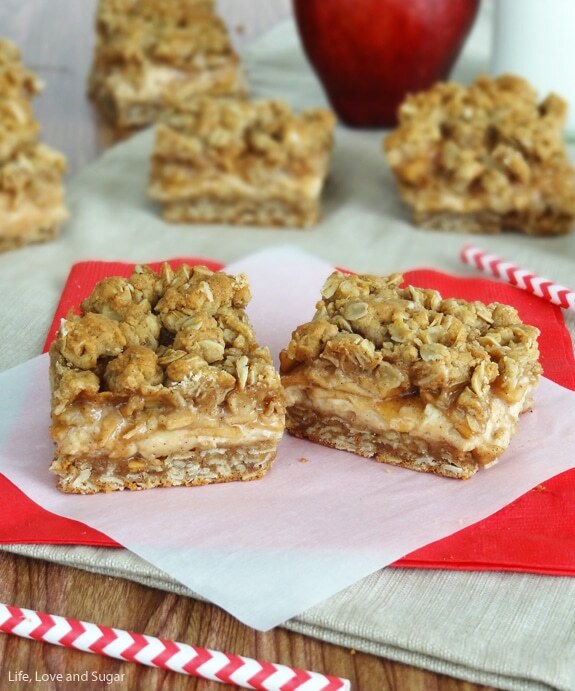 I am such a cinnamon apple fan and paired with a cinnamon cheesecake in these bars, they are completely irresistible. 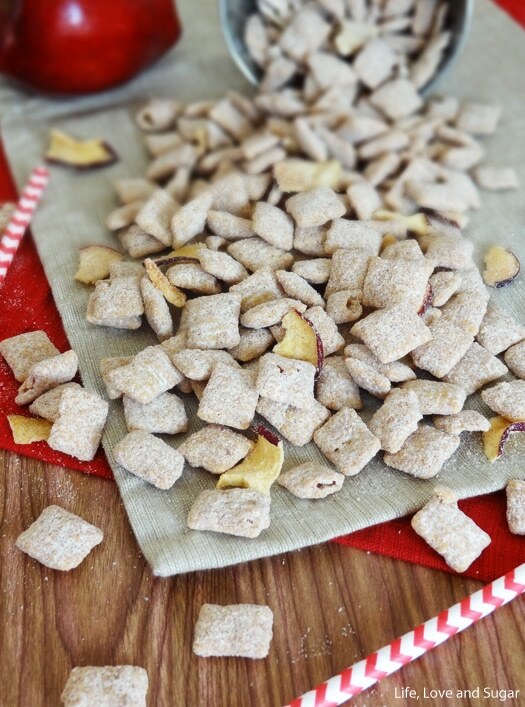 There is no shortage of cinnamon awesome-ness! I actually made them and brought them with me when we saw my family over Labor Day weekend. Everyone seriously loved them. My dad was eating them for breakfast, lunch and dinner. They definitely didn’t last long. 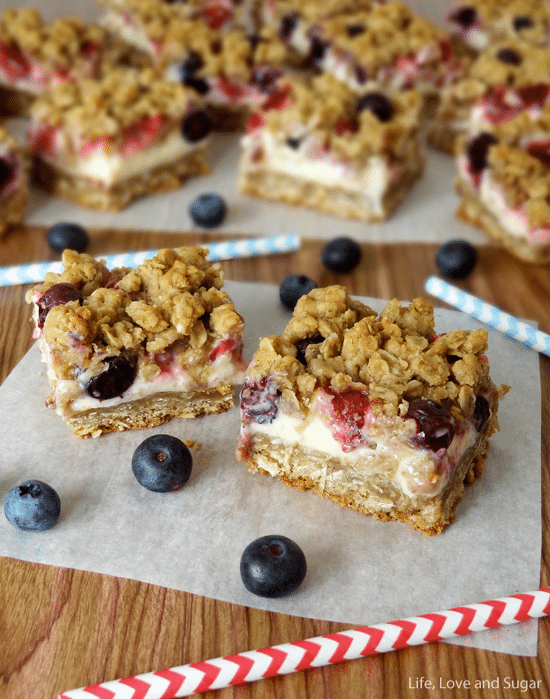 If you’ve tried my Strawberry and Blueberry Oatmeal Cheesecake Cookie Bars, these are a cinnamon apple version and are just as delicious, if not more. You’ve got a layer of oatmeal cookie on the bottom, cinnamon cheesecake in the middle, topped with cinnamon apples and a crumble of the remaining oatmeal cookie batter on top. Delicious. I told you last week that there’s a reason I’ve been kind of off, and even a little MIA recently. I hated being absent from the bloggy things I normally do and not feeling like myself. You may or may not be aware that the hubs and I have been trying to start a family. I’ve been off of BC for about a year now. We hadn’t really been “trying” with any particular plan or anything. Most of the time I had no idea where I was in my cycle, and that didn’t really bother me. There’s been a lot of change for us this year and as much as we want a family, I wasn’t feeling pressured to add more change to the mix. I was really waiting for it to happen naturally and in God’s timing. But since it’d been about a year, we’d started to wonder and talk about whether or not we were “having trouble.” We’d brought up the idea of going to get checked out to make sure we were both good and able, but hadn’t really done anything yet. So at the beginning of August, I downloaded an app and tried my best to remember when my cycle had started the prior couple months to get it as accurate as I could. Then I missed my period. After a year of negative tests, I’d started to expect to not be pregnant. It’s awful to be so hopeful every month just to be disappointed. So I waited another 2 days before taking a test. The next 2 tests were also positive. We finally believed it and got SO excited. The hubs met me for lunch and we called our families to tell them. It was awesome. Everyone cried. Us included. The next week was great because I was thrilled to be pregnant, but it sucked because I had to go out of town for work for 4 days. I got back Friday night (a week after finding out I was pregnant). Saturday morning the bleeding started. It wasn’t much at first. It could’ve been nothing. I hoped it was nothing. We confined me to the couch for the weekend, just in case. It got worse Sunday and I had cramping. Our first appointment had already been scheduled for Monday morning, so we decided to wait for that. It was the longest. weekend. ever. The initial test at the doctor showed pregnant (my hormone levels were still up), but the ultrasound showed what we feared most – we’d lost the baby. Obviously, it was incredibly hard. I’d only known I was pregnant for a week, but that didn’t matter. It was our baby, and I’d lost it. But my point for sharing this is not to make you (or me) sad. My point is that I want to talk about miscarriages. It’s something people don’t talk about. It’s something I didn’t know much about until this year. Earlier this year, another couple we know had a miscarriage and they shared that with us. Prior to them talking about it, I didn’t really know anyone who had gone through a miscarriage. My mom and grandmother didn’t have miscarriages and they were really my main point of reference. My closest girlfriends haven’t started having kids yet, so I didn’t have their experience to go off of either. I’d always thought that miscarriages happen because something is wrong. That it was an indicator that you may not be able to have kids. Clearly, I was uneducated about it. Which is easy to understand since people don’t talk about. Knowing about their experience when it happened to us really helped. It’s amazing how common it is. Knowing that doesn’t take away the pain. Not at all. But it helps to know that you aren’t alone. And that it doesn’t mean there’s something wrong with you. And it doesn’t mean you won’t be able to have kids. It’s been amazing to hear the stories of people around us. As we’ve shared what’s happened with certain people, they’ve shared their experience with us. I know it can be such a hard thing to talk about, but for me, knowing their experience does help. Especially knowing before it happened to us. The whole process of trying to get pregnant (and being pregnant) is such a crazy learning process. It has blown me away how much I’ve learned about my body. Things you never know until you go through it – unless people talk about it. So I wanted to talk about it. At least a little bit. At least about this part. My hope is that by sharing, I may be helping someone else. You may be wondering why early miscarriage is so common. I did too. From what I’ve read, it seems that during the early weeks of pregnancy there’s a lot of major development going on. The main parts that will make up your baby are beginning to take shape. Apparently, it’s not unusual for something to develop in a way that prevents further development of a healthy baby. That’s when a miscarriage usually happens. I’m doing much better now. I have moments where I can talk about it and be ok, and moments where that’s not the case. If nothing else, I am so grateful that God answered one of my prayers – knowing that the hubs and I can in fact get pregnant. I had been praying about it and clearly God answered that prayer. Not exactly the way I might’ve expect, but it was answered. I believe our time will come and I look forward to it. It will be a wonderful blessing when it happens. We’ll never forget our little August baby though. Like I said before, I hope that sharing my story helps someone else. It’s a little nerve wrecking to put all this out there, but I know the knowledge of our friends’ experience helped me when it happened to us. 4. Add cinnamon, nutmeg, flour, cornstarch and baking soda to a medium sized bowl and combine. 7. To make the cheesecake filling, beat the cream cheese and sugars together. 8. Add egg, cinnamon and vanilla and mix until well combined. 9. To make the apple filling, combine chopped apples, brown sugar, cinnamon and nutmeg. Toss to coat. 10. Line a 9×9 square pan with parchment paper. 11. Spread just over half of the cookie dough into the bottom of the pan. 12. Spread cheesecake mixture evenly over oatmeal cookie base. 13. Add apple mixture evenly on top of cheesecake. 14. Crumble the remaining cookie dough on top of the apples. 15. Bake for 32-34 minutes. Edges should be lightly browned, center may still be a bit jiggly but will firm as it cools. 16. Allow to cool completely in refrigerator before slicing. Store in covered container in refrigerator. This post linked to Shaken Together, Chef In Training, Lady Behind The Curtain, The Gunny Sack, Living Well Spending Less, Tidy Mom, Pint Sized Baker, Ginger Snap Crafts, Buns In My Oven, Kitchen Meets Girl, What’s Cooking Love?, Chic On A Shoestring Decorating, Mandy’s Recipe Box, Simply Sweet Home, Love Bakes Good Cakes, Table for Seven, The Mandatory Mooch, Simple Living And Eating, Recipes For My Boys, Ashley’s Dandelion wishes, Sugar Bee Crafts and Hungry Little Girl. So sorry to hear about your loss! May God continue to give you peace and hopefully you will get pregnant again soon!! Aw ((hugs)) Lindsay. I’m so sorry for your loss. You’re right – we should be talking about these things. Miscarriages happen so much more often than anyone realizes. When you’re going through it or when you’re going through regular infertility, you get all the numbers and it can be shocking to know that the majority of people don’t know how often it happens. My heart goes out to you and your husband, and I’ll be thinking about you. Big ginormous hugs!! Thanks Dorothy! You’re right about infertility too. We have some friends dealing with that now, and it’s also really hard for them. Support (and knowledge) is so important! Hi Lindsay- I am so sorry for your lose. I honesty think that if it had happened to one of my friends, I would not know about it. You’re right, no one really talks about. I wish the best for you and your husband. And also, these bars look amazing! Lindsay, I’m so sorry about the loss of your precious baby. I know how hard it is…. The only advice I have is to give yourself grace in the next several months as you grieve. I pray that you will feel God especially near, when things probably feel rather dark. I came to your blog via Living Well, Spending Less’ link-up. These bars look AMAZING and I can’t wait to try them! I’m pinning the recipe to hopefully try in the next week or two. Thank you Lydia. I fully trust that God has a plan for us. We’ll get through it. I hope you enjoy the bars! be a major project. But the way it reads it is very easy to follow and understand. 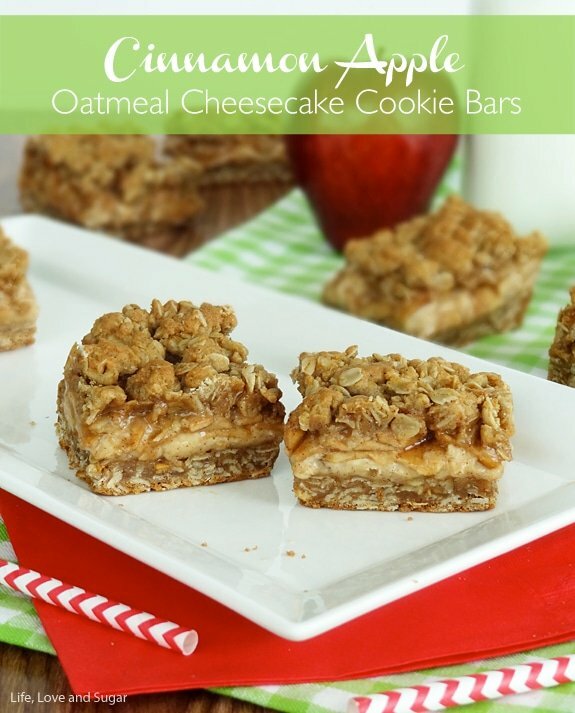 My husband loves oatmeal cookies, so he thinks these are awesome. know he is safe in Gods care until then. May the peace that passes all understanding flood your heart. I’m so glad you liked them Jaime! And thank you! I feel the same way – one day we will meet our baby and it’s comforting to know he/she is with God. So sorry you had to go through a miscarriage. It happened to me too and it is a real loss, but is your body’s way of saying things were just not right. 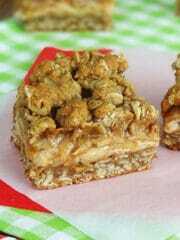 I hope you heal quickly and thank you for joining us on foodie friday with your wonderful cookie bars. Oh my gosh, Lindsay! I am so sorry. I cannot say that I know what you are going through – but my heart aches at the thought! You and your husband will be in my prayers! Thank you Jamie! Thanks for sharing and hosting! My prayer for you is, that you are able to feel Gods peace when you have moments of frustration and sadness. I’m certain that this will help many woman out there that have unfortunately experienced this same situation. May God bless you, for having the courage to share. These bars are a must in my household! I am so sorry to hear of your loss…please know that God is with you and your husband. Thanks for sharing your story; God Bless! As I sit here misty eyed, I truly believe everything happens for a reason. God has a plan and it may not be the way we want it or in the way we thought we’d get it. I remind myself this in my own hardships to help me get through them. I’m so sorry for your loss. You are very brave for sharing your story. 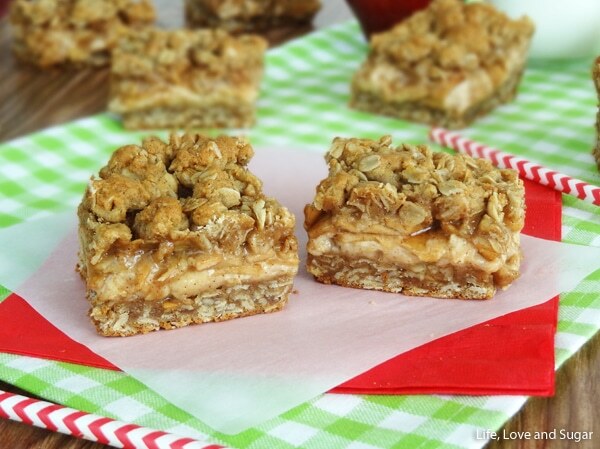 It’s impossible to segway to these cookie bars…but they do look delish! I’m so sorry for your loss! I, also, had a miscarriage. It’s devastating. Praying for your comfort and it does get better with time. Although I have 2 healthy boys now, I do still think about it at times. I think it helps to share and thank you for your story! On a completely different topic, this dessert is outrageous. Thanks for joining us at Marvelous Mondays! Pingback: Showcase Your Talent Thursday #80 - Whats Cooking Love? 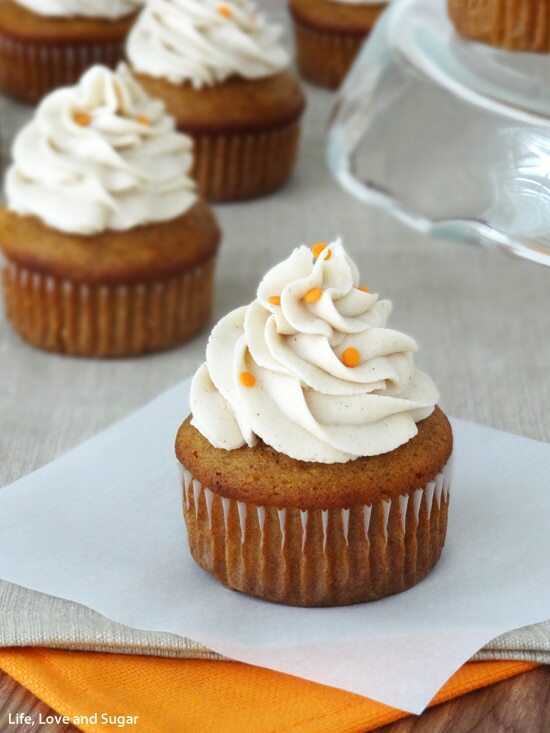 YUM…these look and sound absolutely delicious! This would be great to link-up to Create It Thursday #22…it’s live now! Hope to see you there! I am oh so sorry to hear about your miscarriage. We had a miscarriage our first pregnancy, and an ectopic for our second (about a month later) so I know on some level what you are going through. I’m glad that you are able to make a bit of peace with it. I know Heavenly Father is watching over all of us, and that He will help you through this trial! You’ll be stronger for it, and it’s awesome that you are so willing to share your experience with others. This recipe looks super tasty! I’ll be featuring these on my blog on Saturday. Wow, thank you for sharing Sumo! I’m so sorry for your losses as well. This looks wonderful. Thanks for linking up for Friday Favorites. I’m featuring you again this week! 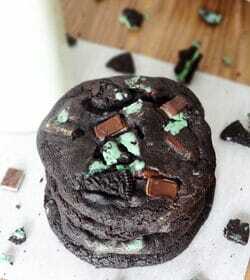 I made these over the weekend as well as the Reese’s cheesecake. Both turned out incredible! Thanks for sharing! 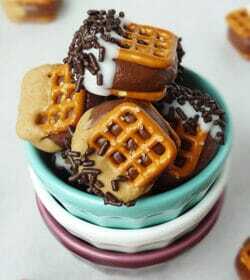 I made these with my 10 year old daughter – so much fun! Incredibly delicious and not overly sweet. This will make a great nut free approved school snack. It’s so hard to come up with nut free , high protein/fibre options for kids…these bars definitely fit the bill! I made these yesterday. It was much easier than I thought it would be. The middle ones in my batch are still not fully set despite being in the fridge over night and baking for the full time. It was also hard to get it out of the pan despite the paper lining. They are very good. 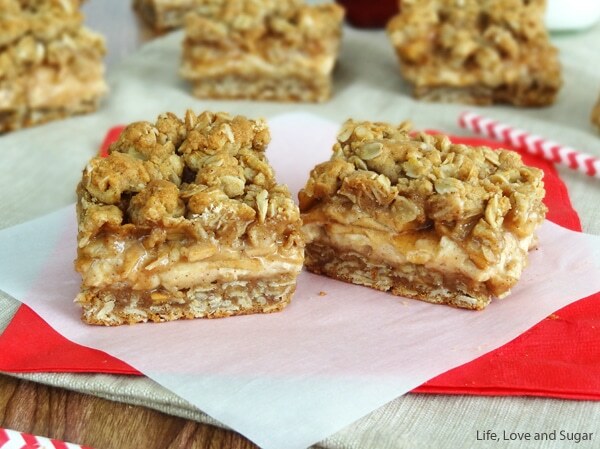 The next time I make these, I will probably leave out the cream cheese filling and double the apple filling. Thanks for the great recipe.